Oh la la. One of these breakfast pastries will keep you going all day long – packing creamy cheese sauce, pancetta and mushrooms atop rich Danish pastry. 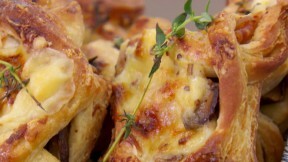 This croque monsier kites recipe is featured in Season 4, Episode 5. To make the pastry, set up a freestanding mixer with a dough hook attachment and grease a large bowl with a little olive oil. Add the flour, then put the yeast to one side of the bowl and the salt and sugar on the opposite side. In a jug, mix the eggs, milk and 4 tablespoons water. Pour into the flour mixture and mix on a low speed for 2 minutes (you may need to push the dough down the hook occasionally). Increase the speed to medium and mix for a further 6 minutes. Lightly flour a work surface and tip out the dough. Shape the dough into a smooth ball. Transfer to the oiled bowl and cover either with a clean tea towel or oiled cling film. Leave to prove for an hour or until doubled in size. Meanwhile, flatten the butter into a rectangle about ½in thick. Place between 2 pieces of baking paper and store in the fridge until needed. Flour the work surface again, then tip out the risen dough. Flatten it and roll it out to a rectangle about 16x6in and about ½in thick. Arrange the dough with one of the short edges nearest to you. Lay the butter in the middle of the dough, fold the dough over the butter in the middle so the dough overlaps slightly. Pinch all the edges to seal the butter in pastry. Place in a plastic food bag and chill in the freezer for 10 minutes. Place the chilled dough on a lightly floured work surface with one of the short edges nearest you. Roll out the dough into a 16x6in rectangle and fold into three layers (like a letter). Place in a plastic bag in the freezer for 10 minutes. Repeat the rolling and folding as before, then return to the freezer for another 10 minutes. Repeat the rolling and folding one final time, then chill the dough for 30 minutes in a plastic bag in the fridge. Meanwhile, for the béchamel sauce, in a heavy-bottomed saucepan, melt the butter over medium heat. Add the flour and stir constantly for about 3 minutes, until completely smooth. Pour in the milk in a thin, steady stream, whisking all the time, and cook the sauce for about 5–10 minutes, or until smooth and thickened. Remove from the heat and stir in the mustard, taste and season with salt and pepper. Add a third of the grated cheeses (from the savory filling ingredients) and mix until the cheese has melted and the sauce smooth. Cover the surface of the sauce with cling film to prevent a skin forming and set aside to cool. For the filling, heat the olive oil and butter in a saucepan over a medium heat. Once hot, add the mushrooms, sliced pancetta and thyme and fry for about 3-5 minutes. Add the garlic and porcini powder and fry for another 3 minutes. Season with salt and pepper then leave to cool. To assemble, roll out the dough until 5mm/¼in thick and place on a large baking tray. Chill in the fridge for 15 minutes to allow the dough to rest and firm up. Re-roll if necessary until the dough is 12x16in. Using a sharp knife cut into twelve 4in squares. Leaving a ½in border, cut a 1½in square from the middle of each square – cutting right through two opposite corners of the inner square, but leaving the other two corners just connected either side of the corner points. Brush the inside square with a little egg wash. Fold the border strip corner to corner, pulling one over the other and pressing onto opposite corner of the inner square, then repeat with the other side (watch Paul Hollywood making them toward the end of the technique video below – it’s easy when you’ve seen it done). Brush the whole pastry with egg wash. In the middle of each pastry place a few spoonfuls of the mushroom pancetta filling. Lay a rasher of pancetta across each one, crinkled up, then cover with 1-2 teaspoons béchamel sauce. Sprinkle with the remaining gruyère and emmental, then season with black pepper. Bake for 20–25 minutes, or until the pancetta is cooked and the pastry crisp and golden-brown. Cool a little on wire racks, the pastries can be eaten warm or cold. For this recipe you will need a freestanding mixer with a dough hook. Note: This recipe contains U.K. measurements and may require conversions to U.S. measurements. It has also not been professionally tested.